We absolutely loved our stay at Jean-Philippe’s place. He made us feel super comfortable and it was incredible value for money. This was a two bedroom apartment and you're staying in the 2nd room that has bunk beds. The host is Jeane Phillipe and he's very accommodating. If you've ever stayed in a New York apartment you'll enjoy your stay here. Located on the 3rd floor 4 blocks from the metro. Nice neighborhood and close to supermarket. He opened up his home to us and we couldn't have asked for a better stay. I will definitely stay there again on my next trip to Paris. Thank you Jeanne Phillipe. 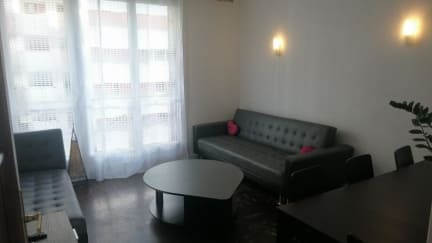 Very good value flat with a lovely Chinese restaurant at the end of the road, half way on the walk to the extraordinary Philharmonie. Best place to stay if you're on a budget. Feels more like an Air Bnb than a hostel. Recommended. A very nice flat near Ourcq metro station. Less than 10 min walk. It was acceptably clean since this is a flat where a single man lives. The kitchen had a small table for 2 or 3 people eating, a cooker I didn't use, a microwave oven, a kettle and a fridge. There was a living/dining room combined where it was more comfortable to eat and it had a nice big TV. The bedroom had a bunk bed and the mattresses would need improvement in the near future. I think we could improve this point. The apartment is actually shared with the owner. JP was kind enough to stay late night to welcome us. If you want a budget trip then this is a good choice. I would have wanted to have the apartment cleaner and arranged. The room for the guests though are full of toys and other stuffs which could have been cleared for a better space. Overall it was a nice place to stay. Nice place! The private room is more like an AirBnB than a hostel, so that was cool. Room was clean, but we did have to change out the sheets ourselves because the previous guests left after the host had left until the following day and we were on our own. Despite not being present, he was really responsive over email! 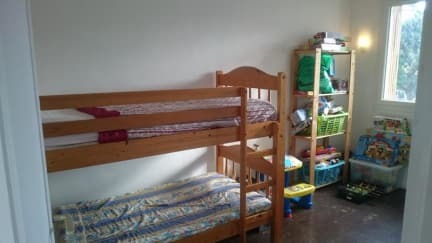 JP house was priced competitively for Paris and a nice enough place to sleep for a night, but please know that it is essentially an extra bedroom in JP's two-bedroom apartment. You are sharing a bathroom across the hall with JP and the door to the bedroom does not lock. JP was very nice and accommodating; this just wasn't what I expect when I think "hostel" and not something I would have chosen as a solo traveler. Probably better for a couple that doesn't mind bunk beds.